The June meeting was held at a wonderful home! 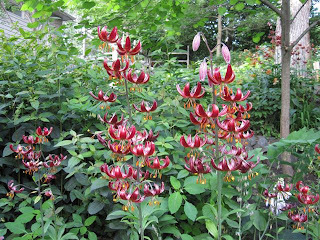 Here there are Martagon lilies of all sorts and colors. 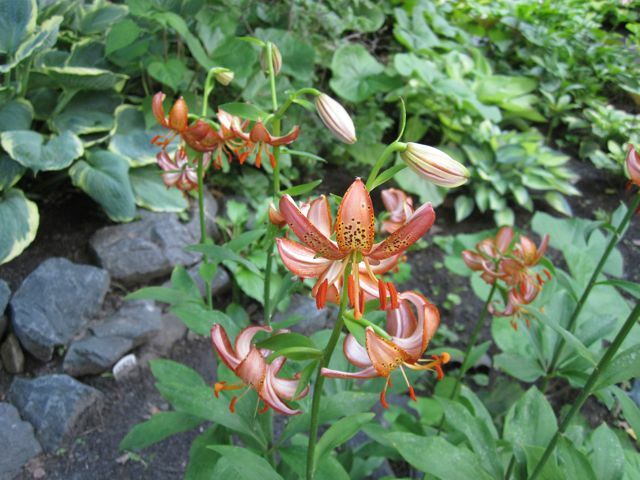 One of the leading hybridizers of Martagons has spent years creating the most lovely and newest forms of this lily! Click on the photos to enlarge them. Martagons come in whites, yellows, oranges and, as you will see, some stunning reds. These lilies can do well with a touch more shade than some of the other sorts of lilies that you might be familiar with. 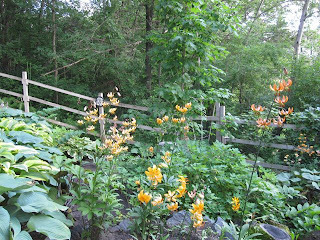 They are upright growers and certain ones get quite tall and majestic. 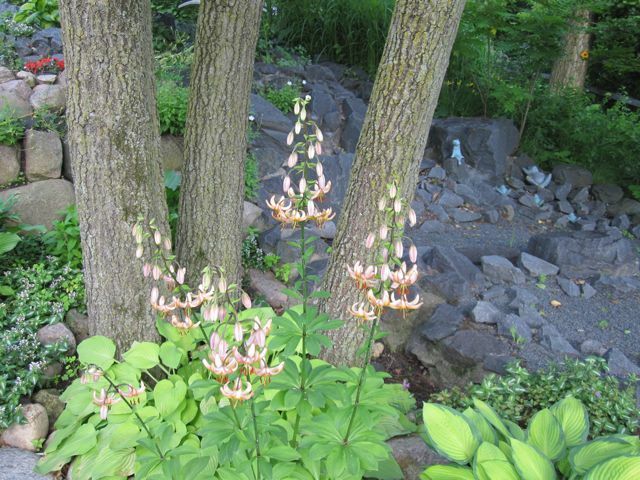 They do well growing with hostas, as you can glimpse in this photo. This is the greatest part. To keep the pollen from a random source off of a flower that is due to be crossed with another particularly chosen flower, a little bag made of bridal tulle is placed over it. It's very light weight and lets in sun and air, but keeps out bees and insects that may come to pollinate it. 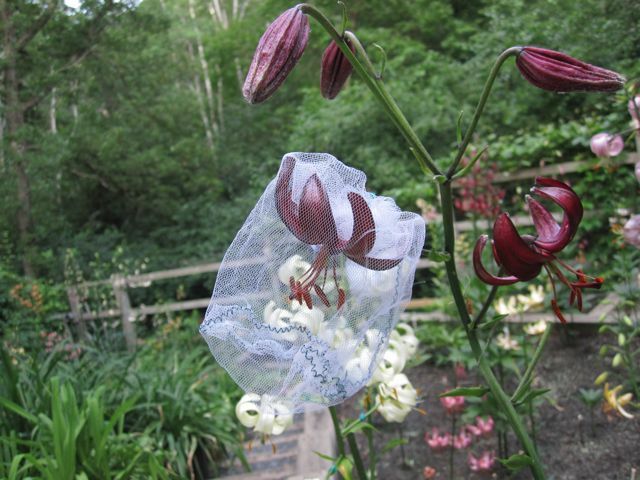 This flower will be hand pollinated and labeled and the resulting seed with be harvested and grown out to see what the new hybrid will look like. 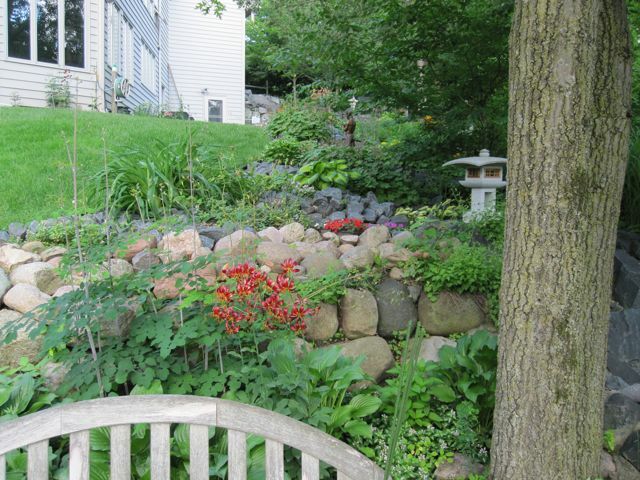 It can take nature up to 7 years till the newly seeded plants will be mature enough to produce the first blooms. 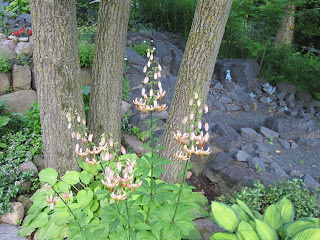 Patience is golden in hybridization! 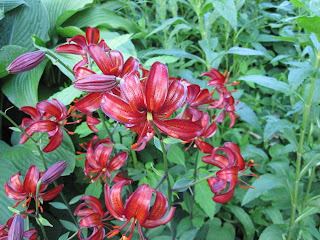 For more information on Martagon lilies email the blog at nsavctc@gmail.com and you can privately be put in touch with the hybridizer.